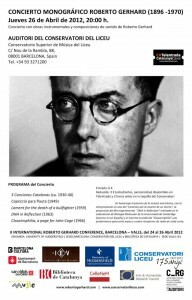 This blog entry commemorates the concert dedicated to the Anglo-Catalan composer Roberto Gerhard (1896–1970) that took place in the Auditori of the Conservatori del Liceu in Barcelona the 26th of April 2012. The soirée was part of the activities of the II International Conference Roberto Gerhard and the Spring Festival of the Conservatori del Liceu. Gerhard is, perhaps, best known as a pupil of Schoenberg but he was also one of the very few pre-1900 composers who dared to venture into the uncharted field of composition with manipulated tape. His centre of operations in Cambridge was a modest domestic studio fitted with a handful of EMI and Ferrograph open-reel tape recorders. Incidentally, he was also one of the few composers in Britain to receive support from the BBC Radiophonic Workshop. Contemporary of more widely-known electronic music pioneers such as Schaeffer, Henry, Varèse, Babbitt, Maderna, Berio or Stockhausen, the Spanish-born composer Roberto Gerhard—convinced of the expressiveness of recorded sound, which he aimed to bring to a level of poetic imaginery in his “sound compositions”—is probably one among the most original and distinctive voices of the early days of the new medium. Our tribute to Gerhard included the first concert performance of his “radiophonic poem” Lament for the Death of a Bullfighter (1959), for speaker and tape, and the Iberian premiere of the film DNA in Reflection (1963), which features Gerhard’s “aleatoric soundtrack” (A.K.A. Audiomobile No. 2 “DNA”). Adding to this gloom, the commemoration of John Cage’s 100 anniversary in 2012 and the partnership with the conservatory of the Liceu, provided the ideal excuse to get engaged in the adventure of a world premiere of Claustrophilia (1966) — a musical action for eight harps and four short wave radios dedicated to Cage that was carried out by a group of intrepid students of the conservatory. The night was rounded off by splendid performances of three of Gerhard’s Catalan songs and his Capriccio for solo flute, also interpreted by students of the Liceu. The concert was made possible thanks to the creativity and dedication of the professors, students, and staff of the Conservatori del Liceu (alongside individual contributors from Barcelona, Figueres, and Avignó) and the kind support of the University of Huddersfield and the British Arts and Humanities Research Council project “The Electronic Music of Roberto Gerhard”. Auditori del Conservatori Superior de Música del Liceu. Barcelona, Thursday, 26 April 2012. Auditori del Conservatori Superior de Música del Liceu. Barcelona, Jueves 26 Abril de 2012.